The news spread quickly on Thursday afternoon following the actor's tweet, "Am doing the Oscars so the young woman in the pharmacy will stop asking my name when I pick up my prescriptions. Looking forward to the show." This Oscars ceremony has had a few behind-the-scenes tweaks over the past week, starting with former co-producer Brett Ratner's resignation. The "Tower Heist" director used a gay slur during a screening last weekend, and critics quickly called for Ratner to be stripped of his Academy Awards production duties. Ratner apologized for his comment, and on Tuesday had resigned from the job. Eddie Murphy quit next, saying he understood the perspectives of all parties involved, and wished the new producer and host the best. So now we have veteran filmmaker Brian Grazer in the co-producer seat along with Don Mischer, and Billy Crystal as host. The 84th Academy Awards will air on Sunday, February 26, 2012. Viacom is one of the companies that supplies movie programming to satellite television Dish and Direct and Cable companies. Viacom and the other companies need to be investigated by the FCC Chairman Julius Genachowski, and the Better Business Bureau these companies are ripping the American people off, they are gaming us; they are not being fair. “There is extortion involved here” ! “Stressed out people need good entertainment, to take their minds off of these hard times”. There are hundreds of good movies not being shown from the 70s to the 90s even early 2000s, they should be showing these movies for free? No one wants to rent them anymore. Look at satellite television and their regular programming nothing but **** on, like I said earlier there are hundreds of good movies they should be showing them in their regular programming! Why they are not showing them, “they are forcing the American people to buy their recently released pay movies”. The FCC and Better Business Bureau needs to look into this as well, entertainment providers are not being fair with the American people, “they are gaming us for every dollar they can get out of us”. This is EXTORTION ! Wake up America you need to get in contact with your congressmen and senators and have “Movie entertainment providers” investigated they are not doing the American people right. Billy will there be a Mr. Saturday Night 2? Billy hosting the Oscars would be great if it was still 1995. Ricky Gervais please. I think if Eddie had worked as the old Jewish guy in the barber shop from his movie Coming to America he would have been great! Maybe next year if G_D doesn't destroy us all. It's about time!!!!! He was the only part of the Oscars worth watching! But Eddie Murphy would've been good, if he used some Delirious or Raw material. To bad Jack Palance isn't being nominated for anything this year. Billy got so much ad libbed material from him. That show was great. Jack Palance's ghost? I'm sure Billy will feed off some poor soul of an actor BIG TIME! That's the fun part, never mind the bloody stupid movie clips. If he co-hosted with Robin Williams, the show would be deadly. Well, it was about time they offered him what he asked for, because, let's be honest and for those who didn't know it: Billy has not done more shows because he for sure was asking a pay check worth both his talent and the tons of more viewers tuning in just for him. Producers of course had always wanted to go under budget and were getting their hands onto low pay (therefore deplorable) hosts, as clearly seen in recent years. Billy's Oscar nights had been among the most memorable and the funniest since Bob Hope's (based on excerpts I've seen via Youtube or TV recollections). His exquisite humor flirts on the borderline that Gervais boldly and often crosses without doing so and keeping it classy and highly funny. Two thumbs up for this turn of events, for my favorite comedian ever. Yeah for Billy! And no Eddie Murphy? No loss! I doubt the Muppets were ever under serious consideration. It would have been very hard on the puppeteers to script out and perform for three hours or more (and it would all have to be scripted, which means no ad-libbing for unexpected events). They could do a short skit but that's about all. It would have been a logistical nightmare to block it all out for the cameras so the TV audience couldn't see the puppeteers as well. Not all the Muppets but if was just Kermit and Miss Piggy, and the actors stayed behind the podium the whole time (except when the camera wasn't on them), that might've worked. If Jim Henson was alive, I'm sure something could've been worked out. Actually Frank Oz has acted and he is also a puppeter so he would be my pick. Plus he turned into a cranky old Jewish guy. Meh, would rather see someone new like Eddie Murphy, too bad Ratner couldn't keep his idiot thoughts to himself. At any rate, I've lost all interest in watching it now, though that's nothing personal against Billy Crystal, but we've seen his version of the Oscars 8 times now, the 9th won't be anything new. He just adds to the snore feast. Did u even try to get Robin Williams? If it started earlier and ended earlier, it wouldn't be a snooze feast. I do not know Robin William's itinerary but he would make an EXCELLENT host if he could fit it in his schedule. If they had the Comic Relief crew, I'd pee in my pants fer sure. Billy IS and will Always be AWESOME! SO Excited! Going to watch it for the first time in years! Billy Crystral should have been the 'first' choice! I'll be watching this award show because that delightful Billy Crystal is involved. Anyone want to bet that he mentions he's Jewish? I mean, like we couldn't tell? That's the one thing I dislike about him: he always seems to have to remind people of his heritage. What does THAT have to do with his performance? Uh, because that's what Jews do? I don't know. If you study the history of show business, most of the people WERE Jewish must be some Mosaic law or something. How about a Catholic like George Clooney or Mel Gibson for once. Thank you, thank you, this is MARVELOUS news. So glad to see Crystal back where he belongs – when he walked out on stage for a brief bit at the Oscars this year, we hoped he had come to save the show. No dice, back it went to the 2 failures that some idiot had thought would liven it up, but who destroyed it completely. Note to Hathaway and whoever that guy was: You have to appear to WANT to do something, not just stand there and wish you were somewhere else. Thank you Oscar producers for getting someone with style, grace, EXPERIENCE, intelligence, and WIT. Crystal will be terrific, much better than anyone else. We weren't going to watch the Oscars anymore after this year's disaster, but we will tune in to see Billy, and hey, we ain't near retirement, so proof that talent is more important than age. Billy Crystal was a great choice! Billy Crystal is the Baby Boomers Bob Hope. The Standard. Show'em how it's done Billy. I'm not really interested in the movies this year, but will watch at least part of it just because of Billy Crystal. And yes, I really do know the real Micky Ward (his uncle is a family friend). Great, an old outdated comic for ab old outdated program. Should do great in the 95 to 100 yr old nursing home audience! Ratner is an idiot. You dont go shooting ur mouth off about gays when u r in show business speaking in a public forum. It was all prob a publicity stunt for tower heist. I'll watch...crystal is classic. Wouldve preferred the wayans brothers...of course williams and goldberg will make an appearance. Its pretty much required. I don't understand why they don't just have Letterman do it again. He was quite delightful. Much better team! Now I will watch. Whoopi mentioned she would host with Billy so why not reunite the Comic Relief folks – that would be fun! Now I have a reason to watch the ceremony. Billy's great. Funny. When Eddie Murphy first started comedy, a third of his routine was based on gay jokes. So, he's doing Disney movie now, but I'm pretty sure his thinking on the subject hasn't changed. Still, he was their first choice as host. Yet they won't tolerate gay slurs? Sorry, but gay jokes were funny twenty years ago, are funny now and will be funny in the future. Eddie Murphy Raw! Was he in 'throw mama from the train' ? I am amazed that with all the talent that is out there, and all these so called wonderful celebrities that the world flock to see and hold in the highest esteem that they find it so hard to have good hosts for these awards – i will agree that billy crystal is one of the best for the awards but you have to ask when he retires who will they turn to – dosen't really show a great pool of talent now does it. Oh goodie! I always enjoy Billy! I enjoy the same great jokes! This is an awards show, right? Freedom of speech at a banquet? Very funny posts! Thanks! You had 3 greats hosting the awards. Bob Hope, Johnny Carson and Billy Crystal. Everyone else was decent to mediocre. Welcome back Billy. Now I want to watch the show. I agree! Watching 3 skeletons dance on stage would have been fun! It should be a law Billy Crystal should be the only host for the Oscars. I'll be watching just because he's the host. Too much Billy Crystal will cause an overdose. There are many other actors perfectly capable to host, with at least as much class if not more so. And where is it written that it has to be a male. As far as I remember only Whoppi has hosted...once. Okay, that's IT! I'm calling Joan Rivers, Whoppi Goldberg and every Jewish actress I can think of to host next year. Please take my threat seriously. I'd watch the Academy Awards, but I have some paint drying and it's more interesting to watch. 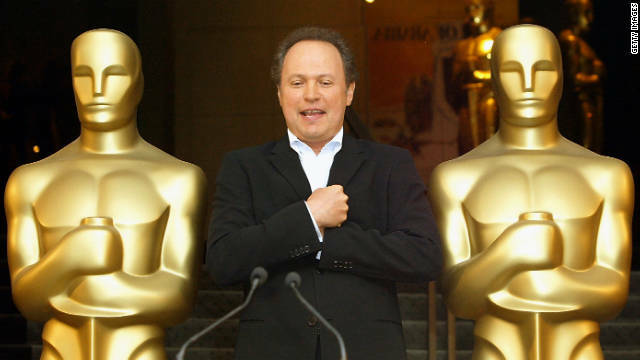 Billy Crystal and the Oscars, a perfect match! A tired old retread hosting a tired old retread! Better watch it, pal. Next year it's going to be Bob Hope's ghost (if only it could be so). I absolutely DO NOT condone slurs of ANY kind, but let me bring a little perspective here. We're not so "safe" here in the States, folks. You can't pray in schools or at football games anymore, can't say "Christmas party" (must use "Holiday party"), In God We Trust" was almost thrown out, can't say the name Jesus anywhere outside of a church or yes you WILL get arrested, stand up for rights (Martin Luther King Jr, Malcolm X), need I go on? And whomever made the remark about "shooting your mouth off to the boss will get you fired", well last I heard Ratners "boss" is not GLAAD. Watch your backs y'all the ACLU is coming after ya. People have no right to tell anyone what slur they can or cant say, just as long as it is not directly stated to a person. When used as a general expression with no certain individual as the target, they can say whatever they want when they want. If you dont like it , leave. Because apparently Murphy is a schmuck! Can't wait to see his opening. Gotta have something about Tower Heist in it. OMG! I'm not watching! Billy looks sick! Yuck. Since you mention it Harrison Ford would make a great host. Oh wait...even better George Clooney (so yummy I don't even need dessert). What difference does it make that Billy Crystal is Jewish. That sounds awfully anti-semantic. He's funny, but you're so immature all his jokes will go right over your head. Just call me OhHeaven. We love Billy! Ratings will be sky high.....a very good call! Best news I've heard all day. Crystal – bringing back the class to the Oscars! Nice move, Academy. Thank you, Billy. I mean it! I think Murphy makes a great Oil Soap. I use it to soak my dentures! I always liked Billy Crystal as the host (and yes, I am under 35!). I wouldn't have minded The Muppets as the host, either, as was being pushed by many of their fans. And yes, people are definitely misunderstanding "freedom of speech". This line comes from the Bill of Rights, which states the government cannot pass any law "abridging the freedom of speech". People can definitely expect more of people and their choice of words and take action when something offensive is said. Businesses can choose to fire you (or push you to quit) if you say something they don't like. Freedom of speech is all about how the government handles it. Private citizens – and businesses – are free to handle it differently. Who watches a boring, long-winded, self-congratulatory show anyway? Oh, that's why it's been around for 84 years. People who go to the movies watch it. Now go back to watching those silly cartoons Dufus. COlady..that's funny that you are calling yourself a lady. Why don't "YOU" crawl under a rock yourself and stfu. Billy Crystal's wonderful performances as the Oscars host in past shows almost made me not care who won the Oscar – he's THAT good!! Irresponsible use of free speech destroys same. Free speech deserves responsibility. I agree Billy is funny, Anne, but for raw talent I'll take Hugh Jackman anytime! I consider calling Eddie Murphy TOAST is a racial slur, Anne! Just because he happens to be black man we shouldn't butter him up! Free Speech – China you disappear, America you're safe? Well, so much for the attracting a fresher crowd ploy. Hey carrieanne you are gay right? It does not bother you then. Good for you! Yes freedom of speech. Classy move all around,,,BC is the man! Tradition is a good thing kids. A safe choice in the PC world. I love Billy, but I'm sorry. The Muppets would have been WAY better. If Jim Henson was still alive, we might've gotten away with Kermit. That'd be a novel idea. Maybe Miss Piggy can host Miss America! A Gay slur is the same as any other. Someone in RATner's position has responsibilities, he set's an example! No one should patronize his films. HATEFUL SLURS breed bad things. Wouldn't see one of his films if I was paid to. Disgusting Person. You have every right to hate Brett & not see movies by this "disgusting person" as much as I have the right to hate GLAAD & LGBT disgusting people. No he is not a disgusting person...he is a person who said a disgusting thing. Exactly what I was thinking, Alex. Billy DOES 'grate' on my nerves. I wish Bob Hope wasn't dead. i would've love to see eddie murphy doing the oscars as a host but it was a inmature remark for the producer to quit his job for the oscar, man let me produce the show and get an oscar it has my name on it. Oscar, here's a suggestion: learn how to write a simple sentence before offering your services as an awards show producer. Clearly you didn't tune in the last time crystal hosted. I don't recall him upstaging lord of the rings too much. Hey Josh, tell that Freedom of Speech crap to Jimmy Hoffa, Martin Luther King Jr, The protesters at the 1968 Democratic Convention and many more. Who said you wouldnt disapear in America for using your so called Freedom of Speech? I DVR Soap on cable. In the Top 10 of shows ever. Well this is a disappointment. He is one of my least favorite Oscar hosts ever. When Billy Crystal hosts, the show becomes all about HIM. A capable, genuine host entertains but keeps thefocus squarely on the guests of honor. In my opinion, Steve Martin is the gold standard here. Wit, class and subtlety. With Billy Crystal, the attention is on his act, his schtick. The movies, the nominees, the event in general are tangential to his routine. That said, come February, I'll still be watching; I'm too much of a movie fanatic to say no. But I'm bummed that Brian Grazer made such a lazy, knee jerk choice. While I disagree with your opinion (I love Billy Crystal as a host) I love your comment. It was a very intelligent and well thought out comment in which you expressed your very valid opinion. I wish more comments were like yours. Some comparison. Granted Steve Martin was on SNL before Crystal. Steve Martin is serious-funny whereas Billy Crystal is funny-funny so you're comparing oranges and tangerines. as the voice says on the episode of Family guy..."How many people will get this Soap reference?" Billy is funny stuff. SOAP was classic as was Billy on SNL. It'll be great. Eddie Murphy would have been so much better. I thought he was funny in Tower Heist. It would be nice to see him in more movies. I am very happy with the new Academy Awards show host; Billy Cyrstal is the best! Vernelle I am so glad I'm not the only one who remembers SOAP! Welcome back Billy! Why do people always have to resign after making a gay comment?? What happened to the freedom of speech? Because freedom of speech isn't simply "freedom to shoot your mouth off however you want regardless of what other people think". It amazes me how ignorant people are when it comes to understanding "Freedom of Speech". What this means is Peoples' speech is protected from government prosecution. In China say you don't like the government you disappear. Say that here and you're safe. That's freedom of speech. You tell you boss to shove it, you get fired. Freedom of speech won't protect your job. @griff "shooting off your mouth regardless of what other people think" is exactly that, FREEDOM OF SPEECH. So you're basically saying freedom of speech should only be nice things everyone wants to hear & make everyone happy but if it's negative towards anyone then you should keep quiet & not say anything. Seems a bit controlled free speech. No, you have the right to say it. But that doesn't mean we have to tolerate you or your speech. Now go crawl back under your rock, troll. Really? What a silly thing to say. You also have the right to bear arms, but you don't have the right to shoot people. 'Freedom of speech' has consequenses. You have the freedom to say whatever you want, but the rest of don't have to like it, or YOU, for saying any insensitive, hurful thing than happens to enter your tiny little brain. I think Eddie quit because maybe he thought his performance in "Tower Heist" was not that funny and was afraid of the critics if they thought he wasn't funny as host for the Oscars. Interesting comment as just about every critic who reviewed Tower Heist said Murphy was the only good thing about it. I'm sure there will be a joke in the show about Eddie's quick departure ! I still don't understand why Eddie quit. I was so looking forward to him as host. Nice to know Billy is back but the Academy should've went all out and got Robin Williams and Whoopee to share in hosting duties with Crystal. eddie quit because he showed his support of Brett ratner. The man was stripped off of producing the oscars for exercising his right to free speech by saying a gay slur. Eddie just said screw 'em, he won't do the oscars & I totally support Eddie for walking away & Brett for speaking his mind. Not that it would matter but I won't be watching the oscars either. The guy was booted because he's an idiot, he's unprofessional, and an embarrassment. I am delighted to see that Free Speech has consequenses for the insensitive. maybe the f@gs should be kicked off the awards show......they can go home and pack fudge. Good to see. Crystal is great in that spot. He'll do well with it. I'm 25 and have known who he is for years. Don't give up on the youth so quickly, there's still a few of us out there left. Would of preferred to see Eddie Murphy though. Perfect! Yes! Sorry to see Eddie out, but bring in a class act. Yea it is! I'm sure no one under 35 knows who he is. Amazing how people love to brag about their ignorance. would that be age or IQ, honey? The young punks seem to be touchy... I guess they're mad because they didn't get a trophy just for posting. He makes that famous champagne, doesn't he? Or is it meth? I'm 22 and know exactly who he is. You're thinking of people under 18. You are aware of TELEVISION, right? People can watch things that were originally shown years ago. No one watches that boring show anymore except the people in the movie business. I know who he is...he hasn't been funny for a long time but, after the anne hathaway/james france fiasco anyone will do. LOVE Billy. He's back as host, FINALLY. I now have a great reason to watch the Oscars! Talented guy. When Anne Hathaway and James Franco hosted, it was such a snooze fest I couldn't handle it and shut it off. And I like them both as actors but not as hosts. Billy will bring on the funny, no question. And I'm 33. When Harry Met Sally is one of my all-time faves. Well, thanks for making me feel so old there, pal! But you're right. I wish Robin Williams would do it just once (another one these babes never heard of). Love.